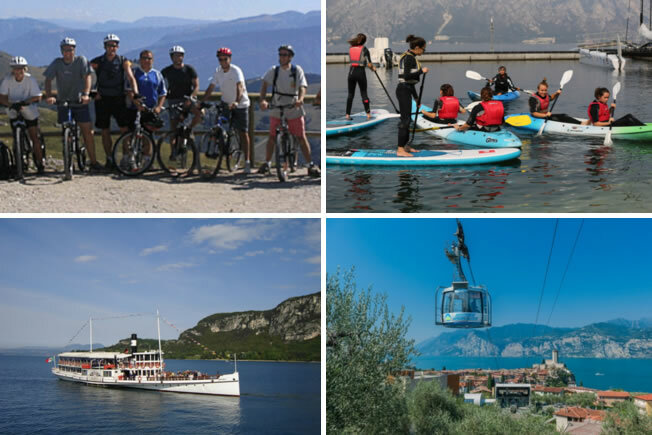 Europa Holidays should be your first choice for a Lake Garda activity holiday. 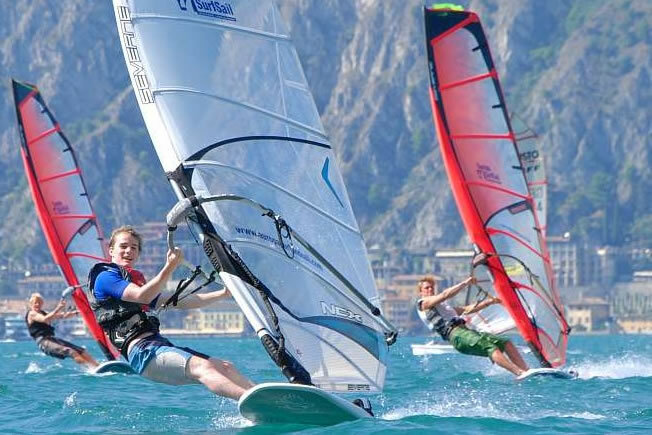 We have the perfect location for windsurfing, sailing or exploring and we welcome families. 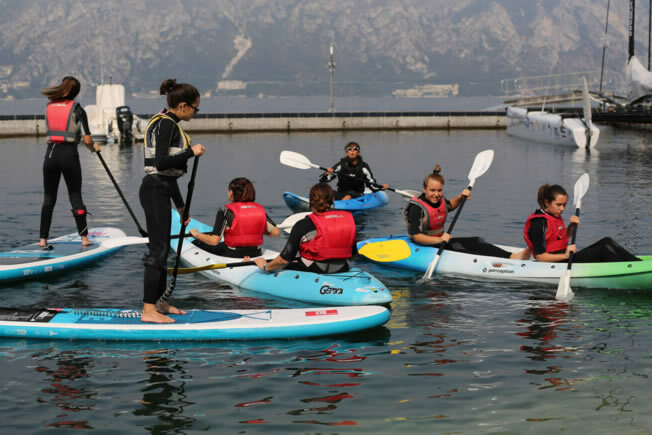 Our watersports centre has well-maintained, modern equipment for all levels and can be reached easily by foot, bus or car from all of the surrounding area. Our location 9km from the north end, means that we benefit from both morning and afternoon thermal winds. 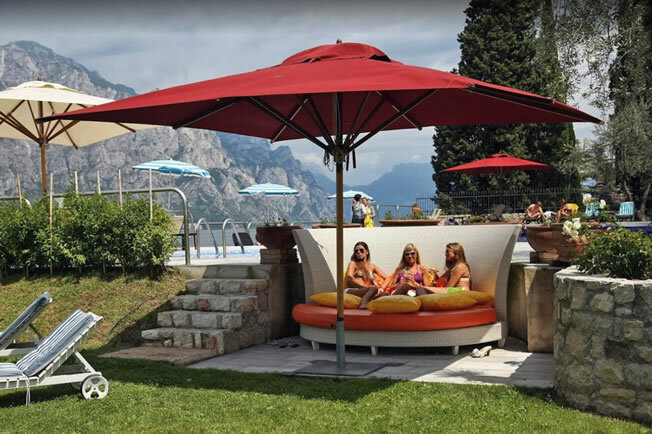 Lake Garda with its thermal winds and proximity to the mountains and classical Italian cities is the perfect place for a holiday. 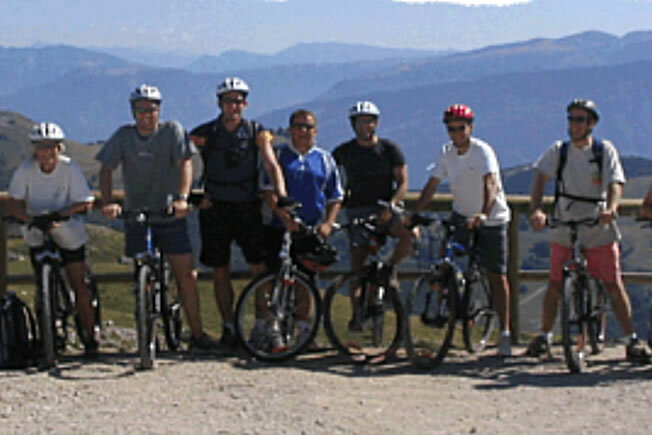 It’s the destination of choice for the passionate sailor or windsurfer as well as for mountain bikers, climbers and lovers of all outdoor sports. The cities of Verona and Venice are only a couple of hours away which mean that culture and shopping are very much on the agenda for a family who want an all round holiday. 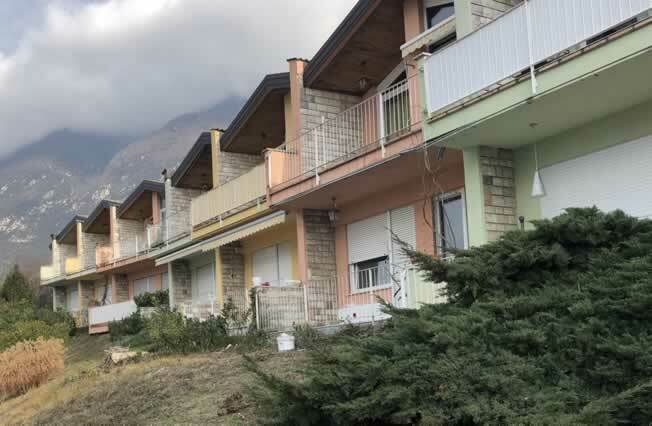 We are happy to offer a wide range of accommodation to our clients, either close to our centre or near to Malcesine depending on the needs of your family or group. Camping pitches for tents or camper-vans can also be pre-booked via our office. 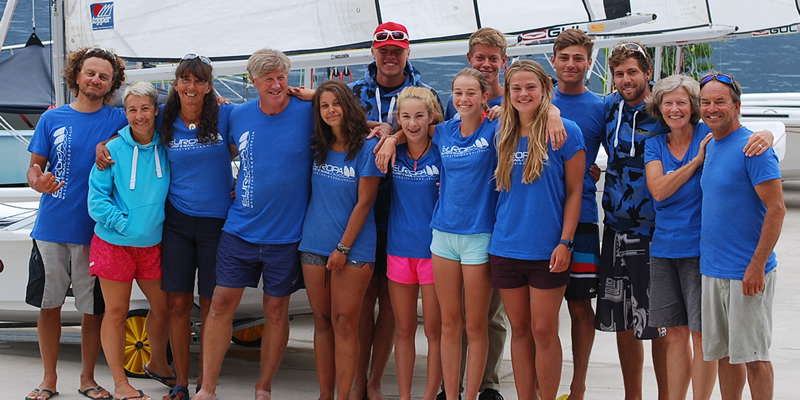 At our dinghy and catamaran sailing centre, just north of Malcesine, we offer RYA certificate dinghy and catamaran courses as well as “funsails” and personal coaching. 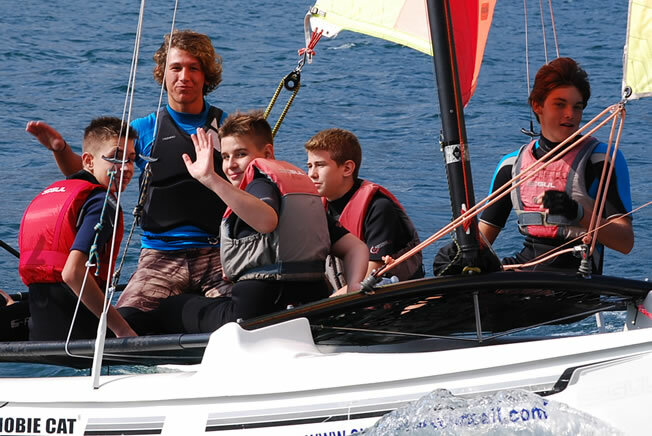 All of our training maximises time on the water for a great practical sailing experience. Our location 9 km from the north end of the lake means that you can sail during both the lighter afternoon winds and the stronger morning winds. Book a sailing holiday with us or make sailing part of your family or group activity holiday. 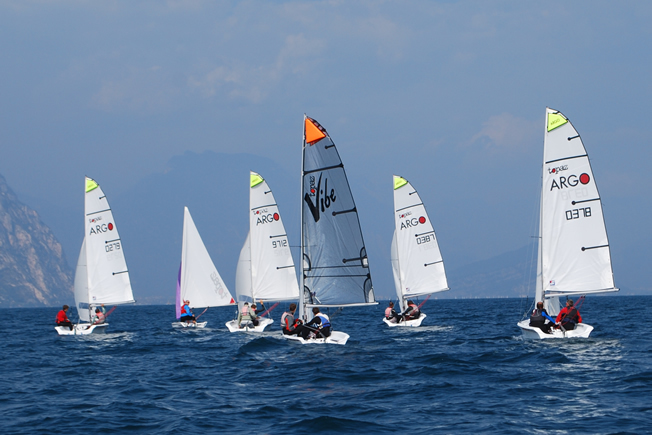 Our rental and sailing courses use a wide variety of dinghies, suitable for all ages, sizes and abilities, from the 5-person Topaz Omega, to our fleet of individual Toppers. 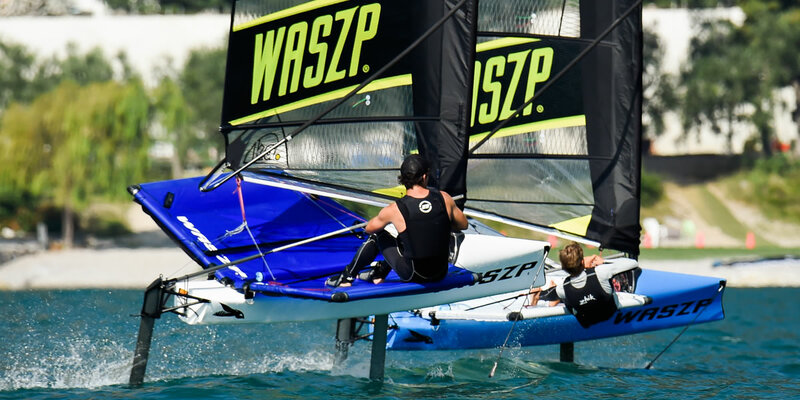 We also have trapeze dinghies with gennakers, an SB20 and the all-new foiling WASZP. Our catamaran fleet consists of Topaz and Hobie catamarans from 12′ to 18′ including a race-ready Hobie F18 Tiger. All of our courses have the emphasis on practical windsurfing with the minimum of time studying theory. Personal coaching can be organised for those who wish to perfect a specific skill. 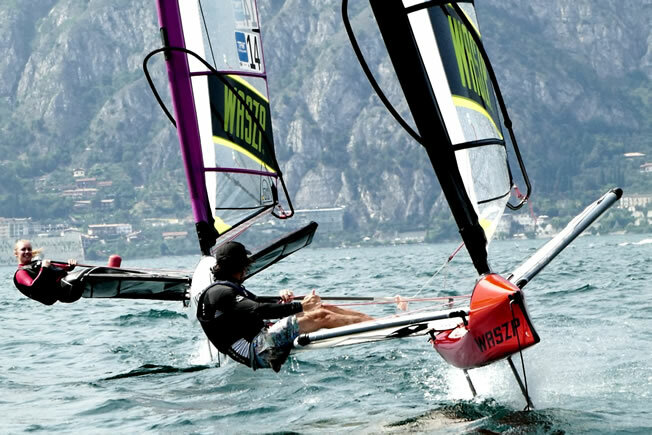 Our windsurf centre is located in a warm, sunny location with morning and afternoon winds. The morning winds, typically Force 4 to 5, suit more experienced windsurfers while all surfers will enjoy the lighter afternoon wind. Book a windsurf holiday with us or make windsurfing a part of your family or group activity holiday. We offer the world-leading ranges of Starboard boards and Severne sails. 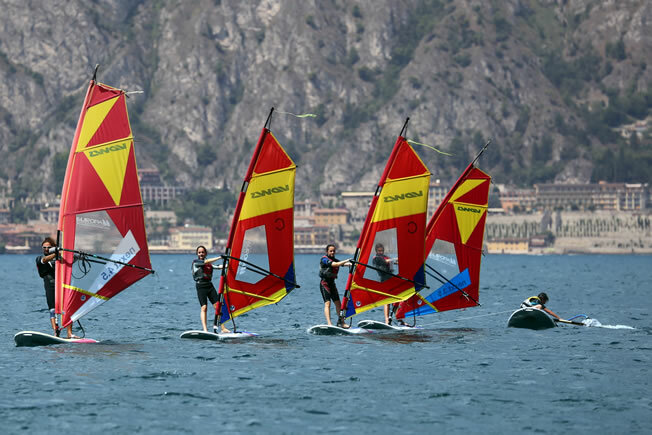 Our boards and sails are new each year and are chosen for their suitability for Lake Garda and can be matched in hundreds of combinations, to suit beginners of all age, weight and athleticism or to provide planing thrills in most conditions, for experienced windsurfers. We have an average of more than 9 hours sunshine from June through August and 80% of the days there is a good wind away from the shore (Force 4 or above). 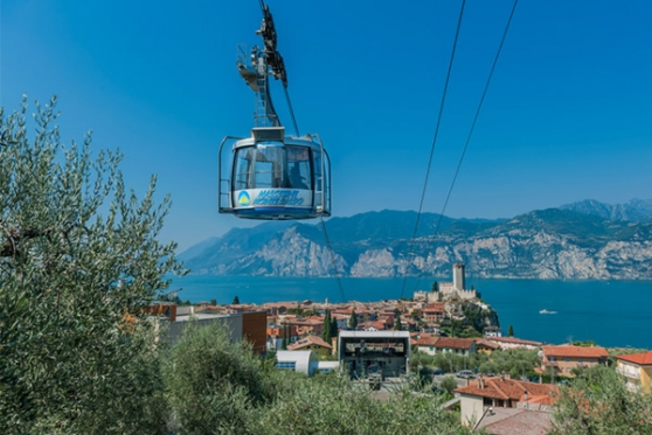 It can be very hot but there are always cool places to go such as the Monte Baldo cable car or the little castle of Malcesine, where you’ll also find the best ice-cream shop. The cities of Verona and Venice are only a maximum of a couple of hours away which mean that culture and shopping are very much on the agenda for a family who want an all round holiday. Nearby is one of Europe’s best theme parks: Gardaland and the festival towns of Bardolino and Lazise. 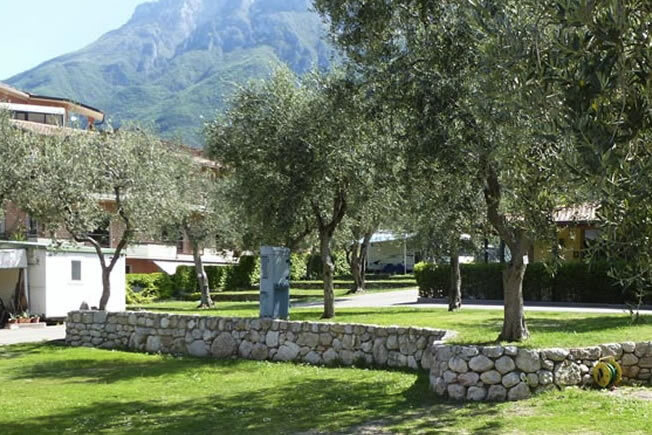 we can usually arrange baby-sitting for those who wish to visit the Opera or have a romantic night out in one of the excellent restaurants in Malcesine or Riva del Garda. This is my fourth time sailing with these fantastic people. Nothing is ever any trouble. Always looked after 100%. Professional and friendly what more can you wish for from an amazing sailing centre. Just booked my accommodation for next year, counting down the days when I am back sailing on Lake Garda. From the South, pass through Malcesine and we are on the left after 4 km. You will see a small boat harbour with a floating pontoon about 100m long; turn left into the main entrance of the sailing centre. 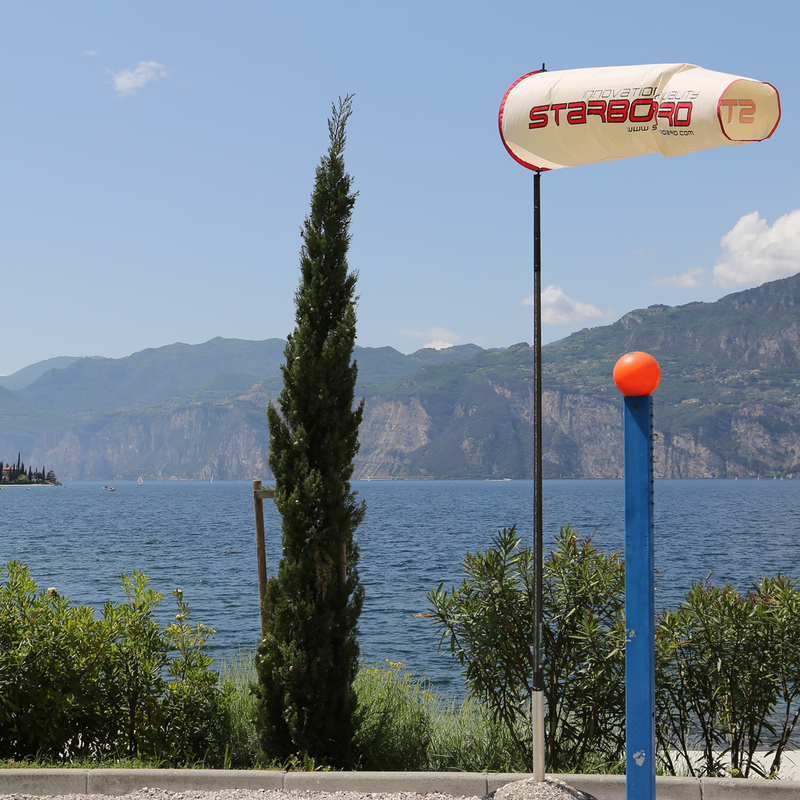 From the North, follow the lakeside road South from Torbole for 9km. We are inside the FVM Sailing centre which is 500 metres after you pass through the village of Navene. Use the second entrance for public parking. 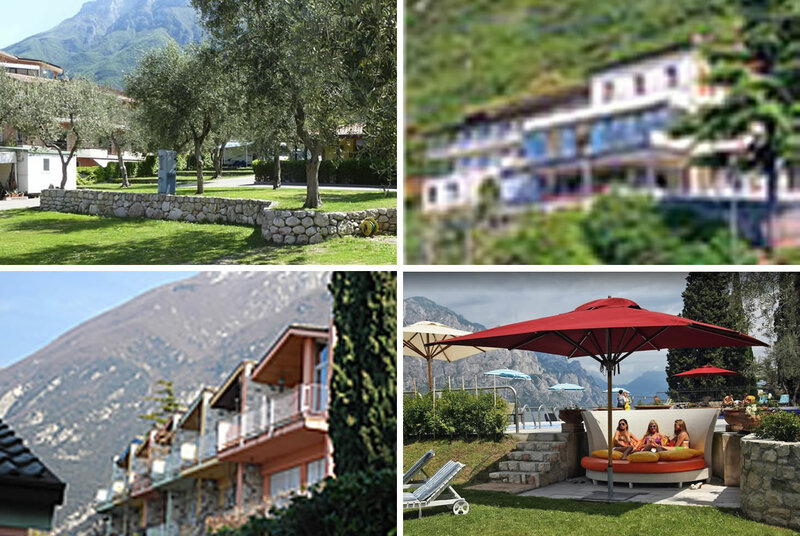 Europa Holidays Ltd has been operating on Lake Garda since 1994. 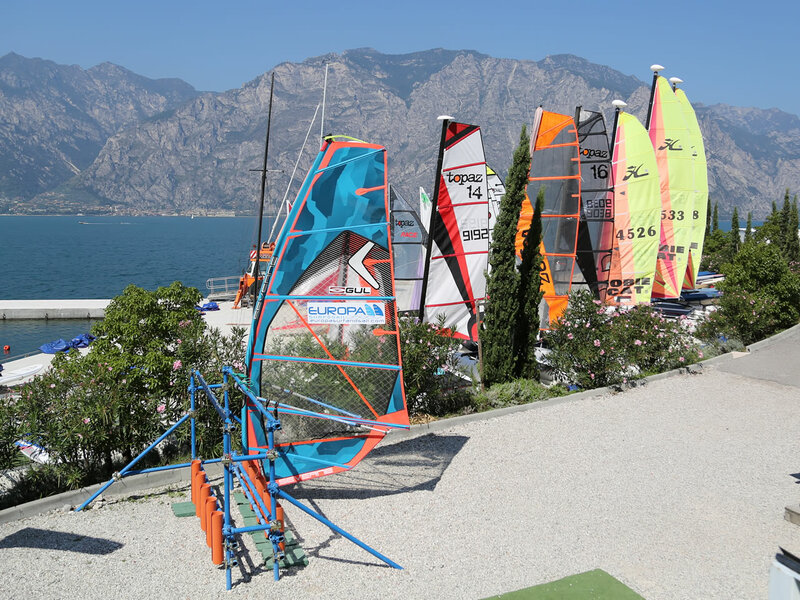 Our RYA sailing centre is at Malcesine's stunning and well equipped Malcesine Sailing Club (Fraglia Vela Malcesine). We provide first class tuition on well maintained teaching kit in clean and friendly waters. The stunning surrounding scenery, the regular winds, the warm water of the Lake, the well-known hospitality and child friendliness of Italian hoteliers and restaurant owners, the relaxed atmosphere of the medieval town of Malcesine and the close proximity of so many things to see and to do offer a flexible and attractive holiday for all members of a group or family. Europa Holidays Theme © 2019.